Priced from $297.89 and powered by a 140cc Briggs and Stratton engine, with a shipping weight of just 64 pounds and a recoil start system, it is any wonder this lawnmower is a true gem? It also has a 21 inch deck and runs on unleaded gas. Its rear wheels are 12 inches high, and it has both side discharge and mulching options available. It is a CARB compliant push lawn mower. Its power source is manual, not gas powered like the one from Husqvarna. Is the Poulan Pro PR500N21SH Push Lawnmower for you? It is very easy to assemble, with only the handles to be assembled with two bolts and the height of wheels to adjust. It’s lightweight which makes it easy to push around. Its mulching features are excellent, as it leaves behind no clumps or discarded clippings on the lawn, and makes for very good landscaping. 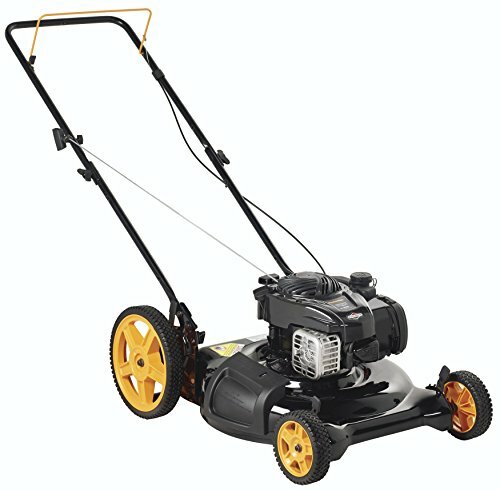 It starts on a single pull every time, as per the Poulan lawn mower reviews. It is easy to turn and to run on somewhat rough terrain thanks to its large rear wheels that make for easy maneuvering. It survives even tall or thick clumps of grasses without the frustration of choking or breaking down. You can adjust the height of the blade as per your requirements. The deck does not need cleaning after every mowing session because of the accumulation of grass clippings, which is really a good sign. Some of the problems reported were that it arrived with its paint missing in some areas. Further to that, it does not have a self propel system, but that is more than made up for by the lightness. It does not seem to indicate the level of fuel very well, which may cause a problem. It does not have the bagging option for your clippings which some people prefer. It does not cut as smooth as some other companies like Toro. However, considering the fact that it is less pricey, it gives good worth for the money. The side cover seems to be a bit flimsy, which is not good if you intend to use it roughly. Some poulan pro lawn mower reviews suggest that it is not too sturdy for use, because even running it over a small root can cause a crack in the engine mount. The carburetor is plastic not metallic, which will be a real disadvantage in terms of deterioration over time. There are some problems reading the instructions also in terms of clarity. As it is durable, it works well for larger yards, and particularly for those who want minimal effort in assembling and in pushing around, thanks to its nimbleness and the fact that it mostly comes pre-assembled except for the handles. The downside seems to be the fact that it is not made for very uneven terrain and bumps in your yard, because that may cause some damage. However, if you are the kind of person who lets their grass grow really tall before cutting it down this a good mower as it can deal with that kind of growth.